One of my big goals with intuitive eating is focusing on getting in more vegetables to make my diet more nutrient dense. It’s a part of my diet I didn’t get enough in while macro counting, especially when during marathon training when I was just trying to get in enough macros and calories. Here’s the four ways I’m adding in more vegetables as I eat intuitively. If you’ve been reading this blog for any amount of time, you know I love my morning oatmeal. And I almost always get a serving of fruit or vegetables in with my oatmeal because it’s the easiesttiny breakfast to add those into. Looking for some vegetable oatmeal ideas? 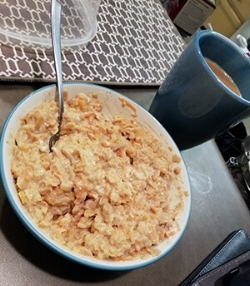 Check out my past posts for how I make pumpkin cheesecake oatmeal or carrot cheesecake oatmeal! Almost all of my lunches have included side salads. Even if it’s just a lettuce mix and dressing, I’m getting in a serving of leafy greens. But I’m trying to add in more vegetables to my salad (some of my favorites are sweet mini peppers, cucumber and shredded carrots) to get in an extra serving or two of vegetables. Lately, I’ve been making sure I have ready to snack on vegetables so they are easy to grab and go. That makes it easy when I’m packing my food for work to grab something to snack on when I feel like nibbling on something plus it means I have vegetables ready to add into meals or salads. It’s so easy to keep a bag of spinach or kale in the freezer and add into my smoothie or smoothie bowls post-workout. Spinach doesn’t add any extra flavor, while I can taste the kale a bit, but it adds in extra nutrients I wouldn’t get just through fruit. Plus it thickens up my post-workout food just a little bit more.